Summer just goes on and on. I can’t stand the heat, but I can’t get out of the kitchen. So I’m concentrating on Simple. And nothing is more simple than a sheet pan dinner. I started with the chicken. Could have used bone-in skin-on chicken breasts or thighs; but I went with the boneless skinless chicken breasts because that was all that was available in the organic section. Then I moved on to the organic produce and went with what looked especially good. Zucchini and red bell peppers. Then I spotted 18-ounce bags of “Organic Vegetable Medley," broccoli, cauliflower and carrots, already cut up and ready to go—I couldn’t resist! Sure, you pay for that convenience, but today it was worth it! You can make a sheet pan dinner any size you want. If I had been cooking for four to six, I would have used an 18x13x1-inch half sheet pan. But this was dinner for two, so I used a 15x10x1-inch pan. And the only reason I lined it with foil is because it is a horribly ugly pan, my only horribly ugly pan, and I thought foil would look a little less tacky. 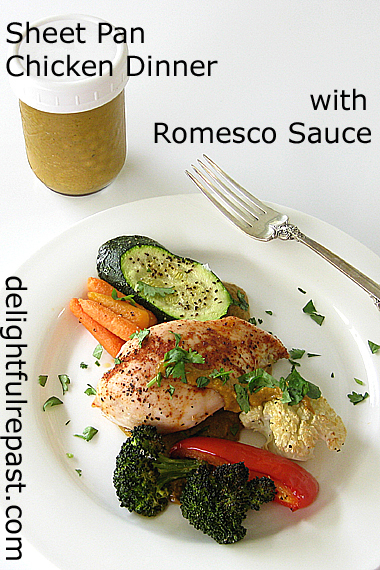 The Romesco Sauce comes together quickly in the blender or food processor. This sauce tastes soooo good that I used next to no seasoning on the chicken and vegetables. I mean it when I tell you, I can eat that stuff by the spoonful all by itself. 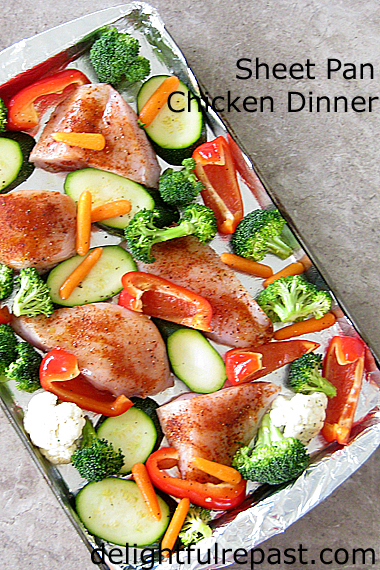 Do you like sheet pan dinners? 1 Preheat oven to 400F/205C/Gas6. Spray 15x10x1-inch jelly roll baking sheet with cooking spray. In small dish, combine paprika and 1/4 teaspoon each salt and pepper. Place the chicken pieces in the middle of the pan and sprinkle them with the seasoning mixture. 2 Spread the vegetables in the pan. 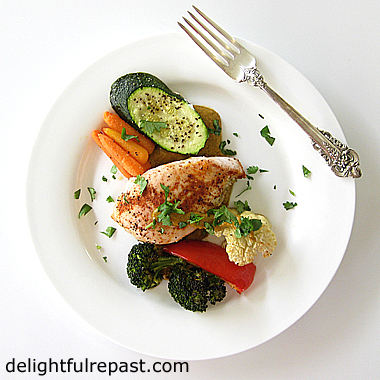 Drizzle on the olive oil and toss the vegetables around a bit so that they are all coated. Sprinkle the remaining salt and pepper over the vegetables. Note: I actually used more chicken than listed in the recipe because I wanted to have leftover chicken for chicken salad sandwiches the next day. 4 To serve: Spread a bit (maybe 3 or 4 tablespoons?) of the Sunflower Seed Romesco Sauce in the center of each plate. Place the chicken and vegetables on top of the sauce. Garnish with chopped cilantro. Put a dish of the sauce on the table because you ARE going to want to add more! Italian meatball sandwiches make a great meal in any weather, but meatballs and sauce might be too much trouble to cook on a hot summer afternoon. No worries. I do my summer cooking in the morning. I developed this recipe with dried herbs so that it could be what I call a Pantry Meal, a meal I can make from what's always on hand rather than having to make a grocery run. And I like to make a double batch and freeze half for another day. Though I usually aim for perfectly round meatballs, when making them for a sandwich I like to flatten them out slightly. Some people put the meatballs straight into the sauce, but I like to brown them first, get a nice crust on them before simmering them in the sauce. But if you do it the other way, that's okay too. Are you a meatball sandwich fan, or would you rather have your meatballs and sauce on some spaghetti? I also like to make double batches of my Spaghetti Meat Sauce and freeze it in these meal-size portions. 1 In medium bowl, combine bread and milk and let stand a few minutes before mashing to a paste with a fork. Add remaining meatball ingredients, except ground beef and olive oil, in the order given. Using hands, mix in the ground beef until everything is well combined. Chill in refrigerator for at least an hour, or in freezer for 5 minutes or so, to make mixture easier to handle. 3 In 12-inch skillet*, heat olive oil. Brown the meatballs in two batches, rolling them around, browning on all sides. Remove to a plate or bowl. 4 In same skillet, cook onion for a few minutes, add in shredded carrot, and then stir in crushed tomatoes, scraping up brown bits in the pan. Add remaining sauce ingredients. Bring just to a boil, then reduce heat. Add meatballs to sauce. Simmer, covered, for 30 minutes. Sauce should be quite thick; you don't want a soggy sandwich. 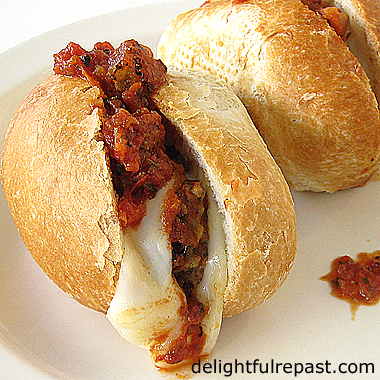 5 Split rolls and line each with thin slices of Provolone. That's another thing that will prevent sogginess. Much better than putting the cheese on top. Heat the sandwiches in preheated oven, toaster oven or broiler just enough to melt the cheese. * I love my All-Clad 5112 Stainless 12-Inch Fry Pan! 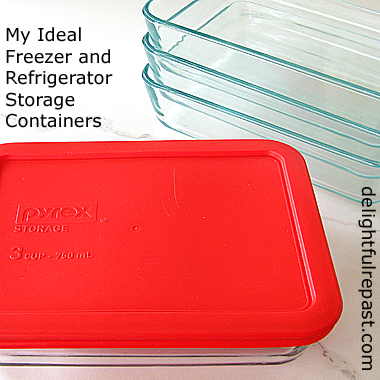 AND my Pyrex 3-Cup Rectangle Storage Containers. I was looking through a catalogue recently and came upon Garibaldi Biscuits and thought, It’s been too long since I’ve made, or even eaten a store-bought, Garibaldi. Of course, you can’t find an organic version, so I prefer to make them myself. It’s a simple biscuit, invented in 1861 by John Carr (of Carr’s table water crackers fame) while he was working for Peek Freans instead of the family business and, for some reason, named after an Italian general who visited Britain in 1854. 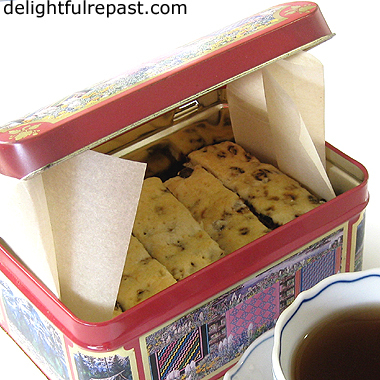 I didn't put enough currants into this batch, just 1/2 cup; you should put in 3/4 cup as listed in the recipe. Since it's a biscuit that's all about the currants, you really can't skimp on the currants! 1 Preheat 350F/180C/Gas4. Tear off a 15x12-inch (38x30 cm) sheet of parchment. 2 In medium mixing bowl, whisk together flour, sugar, baking powder and salt. With fingers, rub butter into flour mixture until it resembles fine breadcrumbs. 3 In glass measuring cup, whisk together milk and egg. Remove 1 1/2 tablespoons of it to use as an egg wash for the top later. Add the liquid to the flour mixture a little at a time, mixing with your hands, adding only enough to make a slightly crumbly dough. Form it into a disc. 4 Place dough onto lightly floured parchment and with lightly floured rolling pin, roll it into a 12x10-inch (30x25 cm) rectangle. 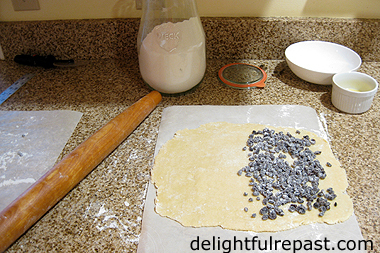 Sprinkle the currants evenly over one half of the dough. Turn the other half of the dough over onto the fruited side. 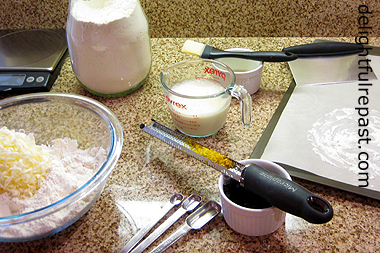 With lightly floured rolling pin, roll out the dough to a 15x8-inch (38x20 cm) rectangle. It will be about as thick as a pie crust. 5 Place the finished dough, still on its parchment, onto a large baking sheet. Using a fork, dock (poke holes) the dough. Using a plastic pizza wheel, trim the dough to an even 14x7-inch (35x18cm) rectangle (leave the trimmings in place) and cut the dough in half the long way and then into 1.125x3.5-inch (3x9 cm) strips and do not separate them. Bake the biscuits for about 20 to 25 minutes, until golden brown. Cool on wire rack and break apart. 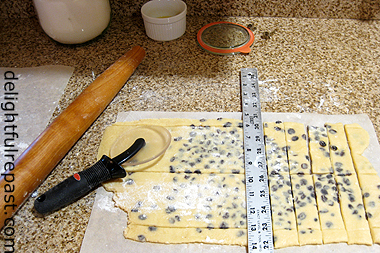 Note: That very precise “1.125” or 1 1/8 inches is because that is the width of the 18-inch metal ruler I use in the kitchen, and the ruler makes cutting the dough very easy. 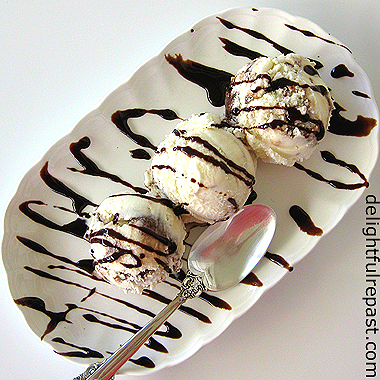 I need some Fudge Ripple Ice Cream, don’t you? All across the US, summer is setting temperature records. So it’s time for ice cream. And I don’t mean ice cream with a cooked base because, I don’t know about you, but the less time I spend at the stove right now the better. So this is a “simple” (meaning uncooked) vanilla ice cream with swirls of a super easy fudge sauce that takes just a minute or two on the stove. I made it up several years ago with ingredients I always have on hand and without the corn syrup that, as you may know, I so hate. I used to have the Cuisinart ICE-21 Frozen Yogurt-Ice Cream-Sorbet Maker, which is wonderful and inexpensive. But then I got the Cuisinart ICE-100 Compressor Ice Cream and Gelato Maker. You can also use the KitchenAid Ice Cream Maker Attachment, if you have one. Some of you might even have the old-fashioned kind of ice cream maker that uses ice and rock salt. Even better if it’s one made of wood! Whichever you prefer is fine, but I can't imagine summer without an ice cream maker! * I always buy organic and Fair Trade Certified coffee, cocoa and chocolate products as well as organic dairy products. 1 In medium bowl (I use a 2-quart glass measure to make pouring into the machine easier), whisk together milk, sugar, vanilla and salt until the sugar is dissolved. Stir in the heavy cream. Cover and refrigerate at least 4 hours or overnight. 2 Meanwhile, at least 2 hours before making the ice cream, make the sauce. In medium saucepan, whisk together sugar, cocoa, salt and water. Cook over medium heat, stirring constantly, until mixture comes to a boil; continue cooking for 1 minute. Remove from heat, and stir in vanilla extract and butter until the butter is melted. Let cool at room temperature, then chill for about 30 minutes before using. If you chill it too long, you'll need to wait for it to warm up a bit because it needs to be thin enough to drizzle into "ripples." 3 Follow directions for the Cuisinart ICE-21, Cuisinart ICE-100, KitchenAid ice cream maker attachment or other ice cream maker. Tip: If you're using the frozen canister type ice cream maker, be sure to freeze the canister for at least 24 hours. 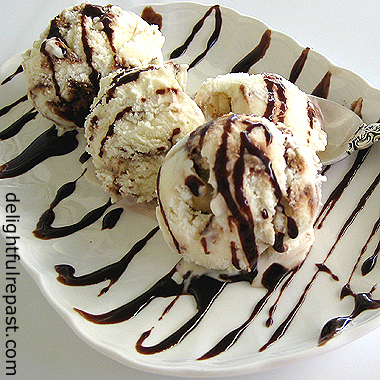 4 Transfer a third of the soft ice cream to a freezer-safe airtight container, drizzle on some of the sauce. Repeat twice (you'll have enough sauce left over to decorate the serving dishes). Place in freezer for at least 4 hours. If it is super hard when you're ready to use it, remove it from the freezer 15 minutes before serving. Today, Classic Scones. 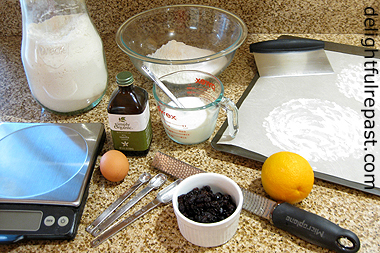 I’ve blogged several different scones over the years: Cream Scones, Fresh Blackberry Scones, Fresh Peach Scones, Gluten-Free Scones (even Classic Scones, but that was in the first month of the blog, so most of you missed it). 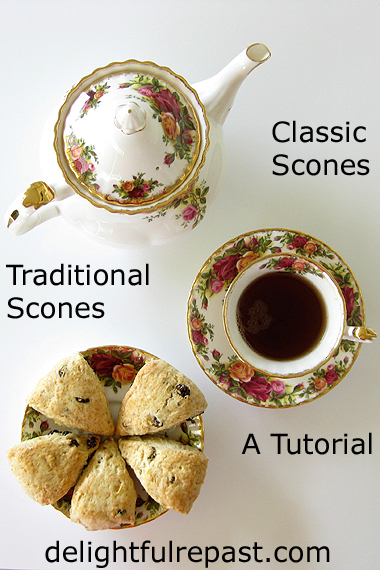 And looking over that recipe, I’ve decided it perhaps didn’t give quite as much detail as a novice scone maker might need; so if that’s you, this one’s for you! A tutorial, you might say. First, let’s talk about the texture of a scone. I’ve had scones that were made by folding and rolling the dough a few times to achieve “layers.” They were delicious, but uh uh. If you want layers, I’ll give you Croissants, Danish or Butteries. I’ve also had scones that were fluffy or cakey. Uh uh. A proper scone has a certain characteristic texture, and that’s not it. Following the recipe directions below should give you the proper texture. More crumbly than flaky, drier perhaps than an American biscuit but not dry. Now, let’s talk about the shape. You can make them round or you can make them wedge-shaped. One is not more “correct” or “British” or “authentic” than the other. 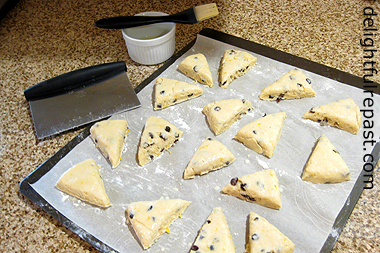 If you prefer round scones, cut the dough with a round cutter (2-inch/5 cm maximum). But I nearly always make the wedge shape, for two reasons: 1) That’s the way my mother and her mother and her mother’s mother made them since the 1880s or earlier in northwest England, and 2) It uses all the dough the first time around, so there are no scraps that have to be worked together for a second cutting. This is perhaps a bit more butter and sugar than my grandmother used but not so much as what some American scone recipes call for. But you want to taste the butter, right? And my mother and I were never ones to pile on the jam quite like my grandmother, so a little more sugar than she used is called for. 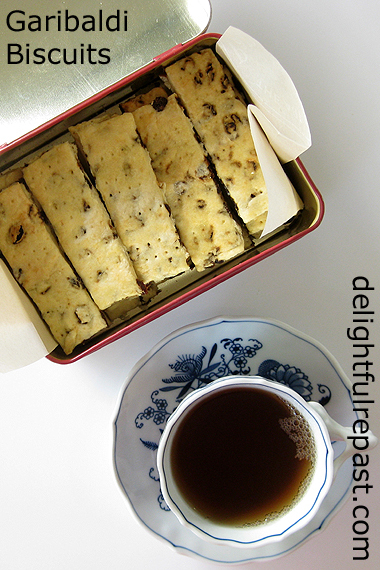 The scones I baked today were for elevenses (British English for midmorning tea break). 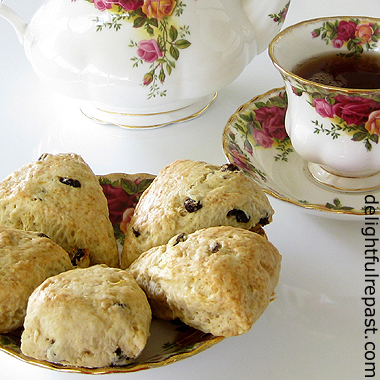 For an afternoon tea, I serve clotted cream, lemon curd and raspberry or strawberry jam with the scones. For everyday tea, though, I enjoy them unadorned. Of course, I’m being terribly opinionated about all this. But if you offer me a scone made by another method along with a nice cup of tea, I’m not going to turn it down! 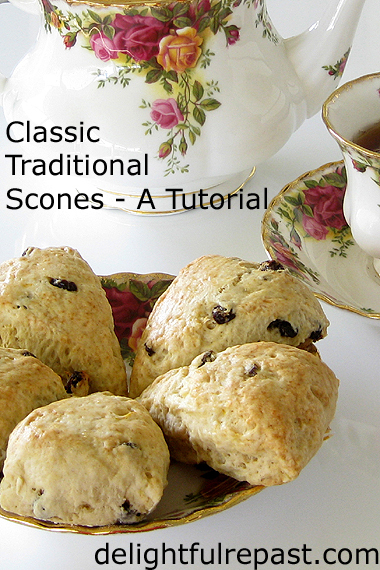 What are your preferences and opinions on scones? Round or wedge? Plain or fruit? 1 Preheat oven to 500F/260C/Gas10. In glass measuring cup stir together cider vinegar and milk. Let stand to thicken a bit for 5 minutes as you proceed. 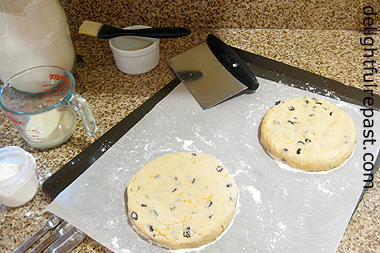 Line a large baking sheet with parchment and sprinkle a bit of flour lightly in two 6-inch circles. Tip: My OXO Good Grips bench scraper has a 6-inch ruler on the edge of its stainless steel blade, making it a perfect multi-use tool for making scones. 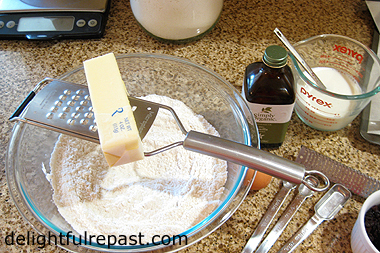 2 In medium mixing bowl whisk together the flour, sugar, baking powder, baking soda and salt. With your fingers, rub the butter (shredded with the Microplane extra coarse grater) into the flour mixture until it resembles coarse meal or fine breadcrumbs. Mix in the orange zest (Microplane zester grater) and dried fruit to coat and separate. Add the egg and vanilla to the soured milk and whisk together; remove 1 tablespoon of the mixture to use as an egg wash. Tip: It’s best to keep ingredients cool. If it’s a hot day, or your hot little hands are making the butter melt, pop your mixing bowl in the fridge or freezer for a few minutes. 3 With a large fork stir the wet mixture, a little at a time, into the dry mixture and gently mix until just combined. You may not need to use all of it (or you might need to add a bit more milk); use just enough to make a soft, but not wet or sticky, dough. 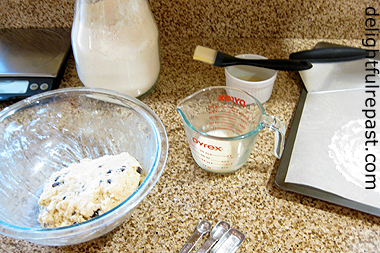 Do the final mixing with your hand; the dough should not be sticking to your hand or the bowl. Do not knead; there's no need to knead! 4 Divide the dough into two roughly equal (no need to weigh, but I love my food scale) smooth balls and place them on the floured circles and gently pat the dough, dusting with flour as needed, into two 5.25- to 5.5-inch (14 cm) rounds. Take a moment to make sure your discs are smooth and flat, almost 1-inch (2.5 cm) thick, and have smooth, straight edges. With a bench scraper or long sharp knife, cut each round into 8 wedges. Pull the wedges out and space them an inch or two apart. Tip: Again, if it’s a hot day, or the heat of your hands has softened the dough, pop your baking sheet in the fridge to cool the discs off before cutting them into wedges. 5 With silicone pastry brush, brush tops only with the reserved tablespoon of milk-egg mixture. Place in oven, and immediately reduce oven temperature to 400F/205C/Gas6. Bake for about 15 minutes or until golden brown. Put on the kettle and make a proper cup of tea. Enjoy the delightful repast! For how to throw an afternoon tea party and a roundup of afternoon tea recipes, see Afternoon Tea Party Tips.